This tutorial explains how to call or run R code from SAS environment. 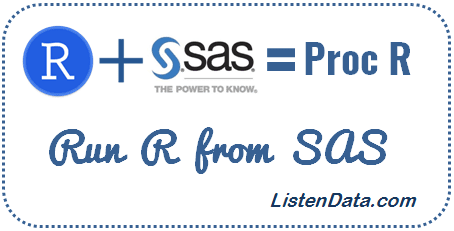 Both SAS and R are leaders in statistical analysis tools for analytics industry. Both the tools have its own advantages and disadvantages. Life would be very easy if we can integrate R with SAS. SAS officially made it possible to run R code via PROC IML. But PROC IML is a paid SAS module which causes user to incur additional cost. R comes with a strong list of machine learning / text mining packages and advanced graphic capabilities which makes it stand apart from SAS. For example, you are asked to forecast 5 years sales. In SAS, you have to purchase SAS ETS module for forecasting procedures such as Proc ARIMA, Proc Forecast etc. In R, forecasting package is available for free and more powerful than SAS forecasting procedures. Xin Wei developed a macro called PROC_R which allows R language to be submitted with a SAS program in the base SAS environment. Check out the link for reference. It was designed similar to PROC SQL which lets users to write SQL queries on SAS datasets. Step 2 : Save the file in desired location. Step 3 : Open the code and update the path of R executable file in the code below. Step 4 : Open Base SAS and call proc_R macro. Replace the existing path in the code with your own path where you have saved proc_R code. SAS2R - specifies the names of SAS datasets to be converted to R dataframe. Can be single file name or multiple files whose names are separated by space. R2SAS - specifies the names of R data frames to be converted to SAS datasets. Can be single file name or multiple files whose names are separated by space. 3 80 82 . 85 . The following program first exports input data in CSV format and R code. Then it imports CSV data from the working directory into R and run the code you put inside %proc_R. Later it exports R log, data frame and image which are later imported in SAS. Here, we are telling SAS to integrate with R to calculate summary statistics on example dataset. Note : It is required to set the working directory with setwd() function. Update your directory in the setwd() function. The output shown in the image above is a truncated one as the real output is large in size. In the program below, we are loading dplyr library and calculating first non-missing record in each row. The calculation would be done in R and later SAS exports dataframe df. The following code creates a bar chart in R and later displayed in SAS Results Viewer. In the macro, we can also specify multiple SAS datasets or data frames. In the code below, we have specified multiple SAS datasets that would be imported into R and then perform some calculation and later multiple R data frames would be exported. 12 Responses to "Run R from SAS"
should R be needed to be installed prior to this change? Yes R is required before submitting the above code. Could R be integrated with SAS VA tool? WARNING: Apparent symbolic reference FGNAME not resolved. WARNING: Apparent symbolic reference FGSW not resolved. ERROR: The macro QUIT will stop executing. What if R isn't installed under program files? Will this still work? I can't change this. What exactly does Progra~1 do? Answered my own question. You can run from another directory that isn't program files. And Progra~1 seems to be a shorthand way of referencing program files. ERROR: No DATALINES or INFILE statement. Files\_TD8300_SM-B-LP-015-SAR_\rhtml_1849969177.html is not a directory. ERROR: No body file. HTML output will not be created. can you help me out those kind of problem.